Pronounced "keen-wah"; a protein-packed superfood commonly mistaken as a grain, quinoa is actually the seed of a grain crop. Quinoa can be prepared much like a grain, but it does not have the same nutritional benefits of grains. It is well-stashed in the protein department averaging 8 grams protein per cup. Quinoa contains all essential amino acids meaning it is a source of complete protein. This seed also houses high amounts of oleic acid (a monounsaturated fatty acid) and omega-3 fatty acids per serving. These are both heart-healthy fats that may decrease inflammation. Quinoa also provides notable levels of folate and zinc, and it is the perfect way to incorporate more fiber into one's diet. Once prepared, quinoa is light and fluffy in texture. 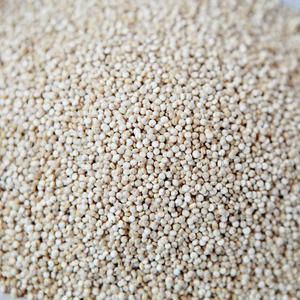 Learn more about quinoa here on our blog!